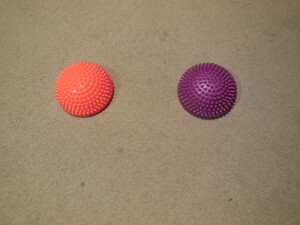 Today’s 44 was a fun push up move – using 2 small wobble balls and a medicine ball. ready – hard to hold this position! 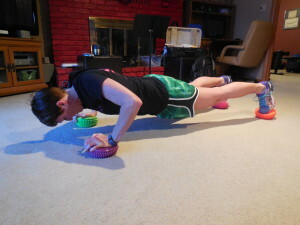 The daily challenge for #happyfitmarch was to do as many push-ups as you could in 2 minutes. I decided to combine my 44 with the challenge. I did a total of 58 push-ups in the 2 minutes! Today is a day full of cello for Hunter. 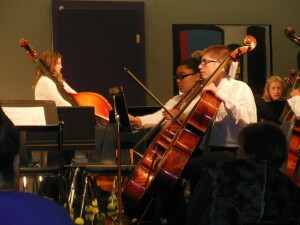 He has his Philharmonic Orchestra concert this afternoon. This is a full orchestra made up of mostly middle school kids in Topeka and surrounding areas. Hunter has enjoyed this even though it is a big time commitment on top of his cello lessons, cello group and sports at school. This will be Hunter’s first solo in front of a large group and I know he is nervous but he will do great. He has practiced and is ready! Good luck, Hunter!!! I know that you will be awesome!!! and felt like I NEEDED them!!! I decided to use them this morning for my 44. I thought push-ups with each hand and foot on one would be a great move!!! This was definitely a challenge!! 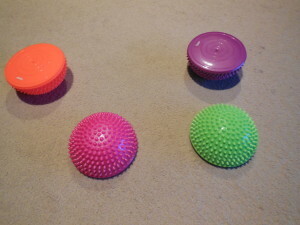 I can’t wait to incorporate these fun little gems into more moves!!! 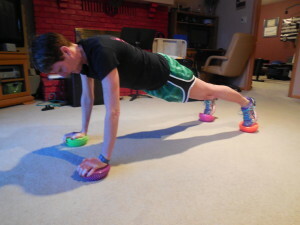 And, the 44 push-ups this morning put me at a nice round 450 push-ups for the week for Taylor’s February challenge. The goal this week was 400 push-ups and in 6 days I did 450!!! Glad that we are going back to lunges next week – lunge jumps actually!!! I also did a quick Turbo Jam workout – 3T (Totally Tubular Turbo). 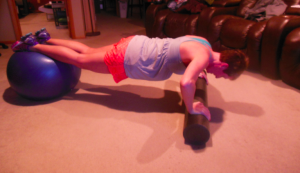 This is toning with a resistance band – I can tell I haven’t done much with bands lately!!! 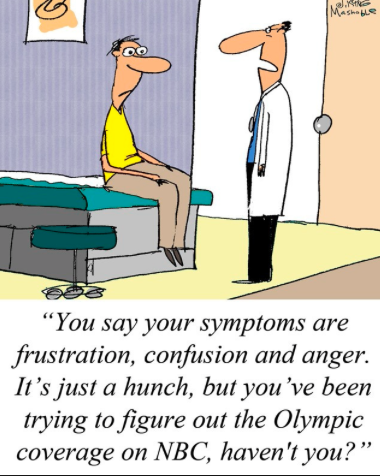 I’ve written about the Olympics a couple of times in the past week because I love watching them!!! However, I have to say that the 2014 Olympics have not been my favorite and I think it is because of how very little is being shown on TV. 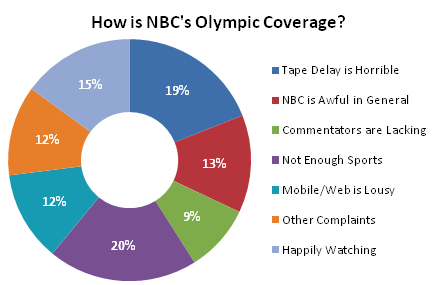 I think that NBC has done an awful job with the coverage this year. Clearly, I’m not the only person who feels this way!!! Just yesterday, the entire morning on NBC Sports Network was devoted to hockey. It was fine during the United States vs Russia game (way to go U.S.!) but then they kept showing other teams. Why didn’t they use any of the time to show the other events that are going on? Then during the prime time coverage on NBC, the first 30 minutes were devoted to a replay of the last part of the hockey game after the announcers already told us exactly what had taken place. 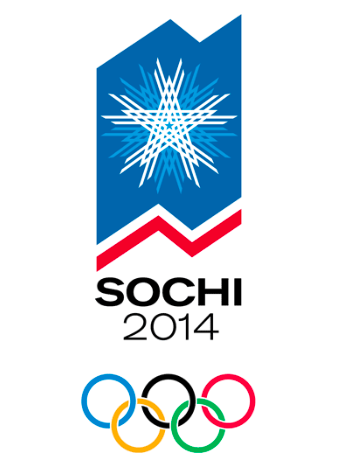 And, I’m disappointed that we aren’t getting to see any medal ceremonies. I have had the Olympics on a LOT in the past week and I think I’ve seen 1 medal ceremony. I love watching the athletes receive their medals and sing along to whatever their National Anthem is. Are you disappointed with the coverage? Today’s 44 is a move that Kristin (Stuft Mama) did with her class and showed on her blog. 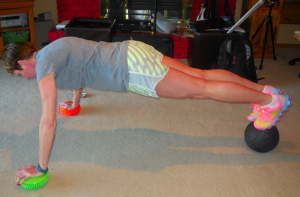 I had to try it because it uses my favorite piece of equipment -the BOSU!!! 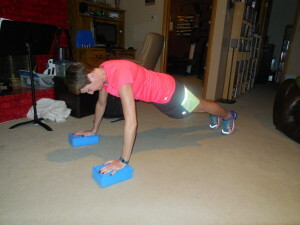 It is a triceps dip with alternating kicks. Since I counted a right kick and a left kick as 1 rep, I had to do 88 tricep dips to complete the 44!!! My arms were shaking! The February challenge with Taylor (Lifting Revolution) is a fun one! Last week we did 100 walking lunges every day. This week it is 400 push-ups split however you like. Yesterday I did 135 push-ups and today I did 80 so in 2 days I’m over half-way!!! And, I added in Les Mills Combat – Extreme Cardio Fighter today. 60 minutes of kicking, punching, twisting and just plain fun!!! 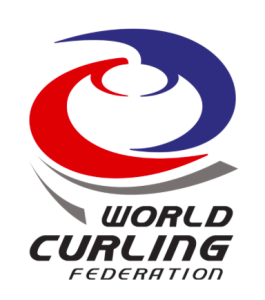 Curling – is it a sport or just a past-time? I don’t even get the concept. Chris keeps saying it is like Shuffleboard. Well, I’m pretty sure that shuffleboard is a game they used to play on The Love Boat so I’m not convinced it is a true sport. 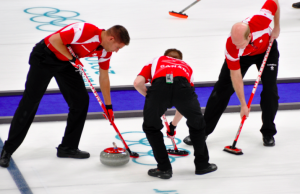 Here’s what I’ve figure out about curling – one person pushes the stone. The rest of the team does a sweeping motion to speed up (or maybe it slows it down?) the stone. Pretty sure the object is to get the stones into certain parts of the ring or something and try to knock your opponent’s stone out of the circle. What I do know is that there is ZERO cardio involved and I’ve never seen any of the participants even come close to working up a sweat. 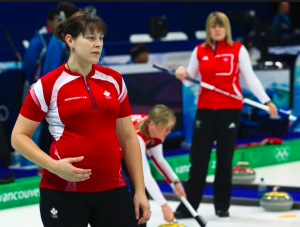 In the 2010 Vancouver Olympics one of the competitors was actually 6 months pregnant – So, if you compare curling to some of the other events in the winter Olympics, is it really a sport? 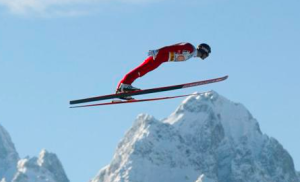 Ski jumping – look at the strength required to hold the body in the jump position!!! 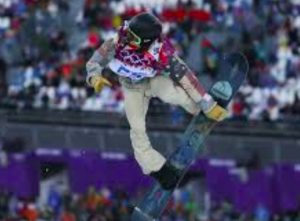 Snowboarding – Half Pipe: These guys (and girls) are flying up to 15 feet in the air on some of their flips. And, then they have to land the jump and do another and another and another…. 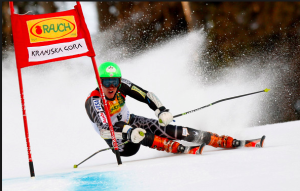 Have you seen how fast these athletes guy down the mountain while still dodging the gates?! Look at the leg strength required to hold the position without falling!!! The amount of athleticism required to perform some of the jumps, holds and other tricks that the ice skaters perform is amazing!!! this while balancing on skates! 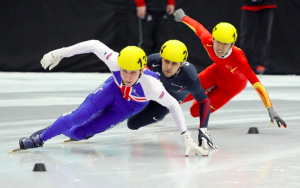 All of the skating races seem brutal – short ones, longer ones – just staying in the low position requires tremendous lower body control!! 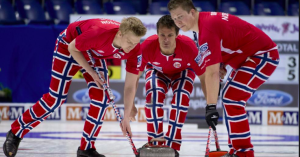 Then we go back to curling – at least they can wear “fun” pants!!! So – what do you think? 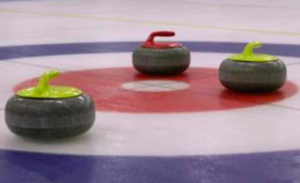 Is curling really a sport or is it just a hobby? Do You Work Harder When Someone Is Watching You? 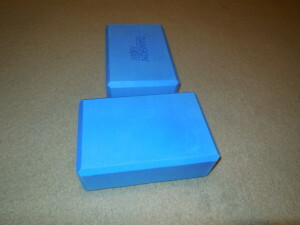 I just put my hands on the blocks for the push-ups so it was a very slight change from a standard push-up. Today was the first time in months that I did a Turbo Fire workout and it was so much fun!! I did Fire 55EZ – don’t let the EZ fool you – this is 55 minutes of high intensity, non-stop moving. During the cool down, Chalean made a comment that has me curious. She said that people tend to work harder in group settings because someone is watching them. This statement really got me thinking because I rarely workout with a group – usually I’m in my basement alone either with a DVD or on the treadmill – however, I feel like I put in just as much effort as I would if I were at the gym. The way I see it, I get up at 5:00 am for a reason!!! 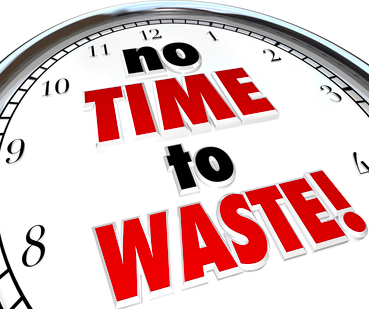 I don’t want to waste that time putting in a half-hearted effort during my workouts whether I’m running, lifting, cross-training -whatever I’m doing. I think that this is something I will really focus on for the next few days and make sure that I feel like I’m working as hard as I would if I were surrounded by other people doing the same thing – definitely something to think about!!! What about you? Do you work harder when you are in a group setting? Today’s 44 was nearly a fail!!! Not long ago I did push-ups using my foam roller for the 44 of the day. 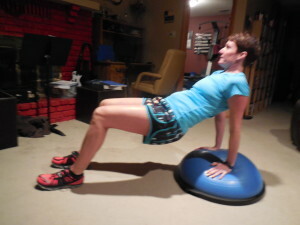 The wonderful and super fit Jody suggested trying the same move but with my feet on a stability ball. Well – I’m always up for a new way to challenge myself so today I tried it! I could not even hold the pose with my toes on the ball so I just went with the tops of my feet and still struggled!!! This move was beyond HARD!!! 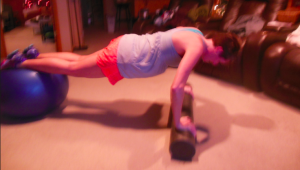 I struggled and by the end my push-ups were barely going down – I’m going to have to work on this move for sure!!! My neighbor’s daughter (she is a few years younger than me!) is still in town and she came over to workout again this morning – so much fun!! Today we did Cathe XTrain – Tabatacise!!! This is definitely a great workout. 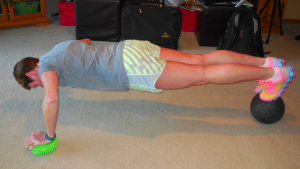 After we were done Erin asked about a challenge move (since we did the plank hold last time) so we did 10 Manmakers. 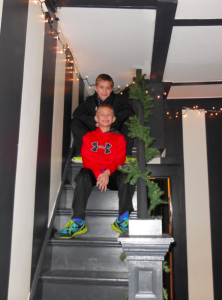 Yesterday we hosted our first annual Governor’s Row House Christmas Day Open House. 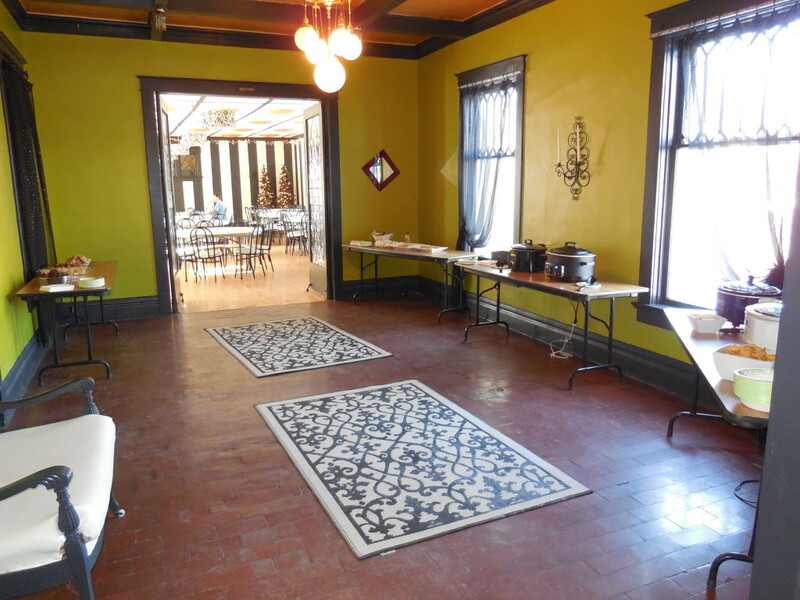 We had no idea if any one would come or if it would be just the 4 of us hanging out over there. It turned out to be a really fun day. Some great friends came and hung out most of the day! The boys (Chris, Jordan and Hunter) played trumpet and cello tunes for us! Plenty of food (lunch and dinner!) 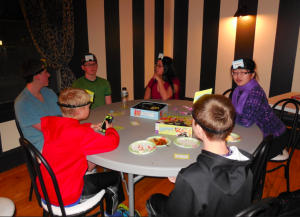 and fun!!! Last week I put fliers in our 3 tenants mail boxes and 2 of them came down for awhile (the 3rd, a young couple, had gone home to Chicago!). Kelvin lives on the 3rd floor by himself (he is going to be 65 next month) and called me around 5 to see if we were still there. He came down, brought Champagne to share (nice! 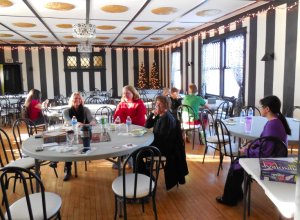 ), ate and visited until we started packing up around 8. He had been by himself (other than his cat) all day and would have spent the entire day that way if he hadn’t joined us. After a couple of hours he said he felt like he had an adopted family!! That comment made my day because all along, my whole goal had been to help make someone’s Christmas better than it might have been otherwise. When he got ready to go back up to his apartment he hugged me and said it had turned into a wonderful Christmas for him! And, the best part – on the way home Jordan rode with me (I had gone earlier to clean since we had an event Christmas Eve, too) and he talked about how glad he was that we had done the Open House!!! This is big because when I first mentioned it to Jordan he did not want any part in it.